Way back in episode 45 Joyce Pinson from Friends Drift Inn. recommended the award winning book the Market Gardener: A successful Grower’s Handbook for Small Scale Organic Farming by JM Fortier who is revolutionizing the way we think about agriculture, small scale farming and most of all how we care for our planet and today he his here with us to share his knowledge and his incredible passion! So I know you are as excited as I am to hear him speak so welcome Jean Martin Fortier!!!! 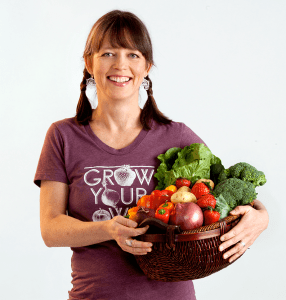 If you haven’t checked out Megan’ Cain’s Creative Vegetable Gardener website I know after this interview you are going to do it ASAP! This has to be one of the best gardening website’s I have ever visited. Not only is it full of valuable gardening information that is sure to lead you to success in your garden but it is presented in a simple and elegant way. Her pages are organized efficiently, the posts have engaging titles like “What Not To Grow In Your Garden” and “Increase Your Garden Success”, that intrigue you so much you just have to click open. I certainly couldn’t resist “Save Yourself from $5 Red Peppers in January” one of my favorite veggies and always so expensive in the store, plus they always feel like they have that wax coating. Linda Simpson blogs about her gardening experiences in Queensland, Australia with her husband Michael on their Small Urban Farm. Judy Frankel shares her incredible gardening knowledge, her expertise in the pesticide and sustainable agriculture industries, and journey to grow nutritious food for her health and family. Today, anyway I am here to talk with Denny Krahe from central Florida, who is a runner, and his emails inspire me, one of the few still in my inbox, and regularly, even though I get to run enough, and I recently found out a lot of listeners are in Florida! He has so many golden seeds to share with everyone. Denny especially inspired me to start some Vermiculutre (worm composting) in my classroom and if I can do it you can too! 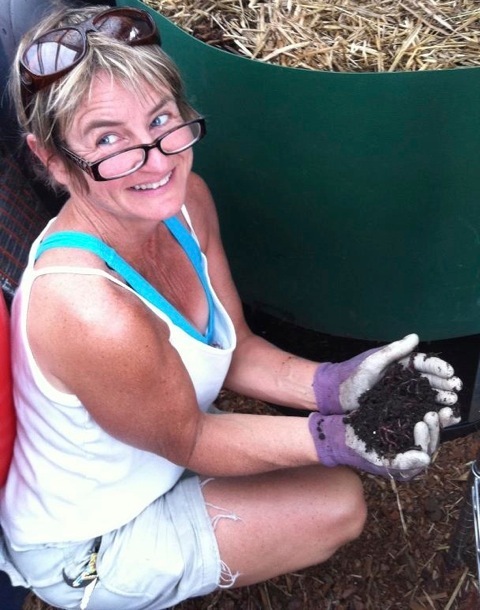 Alissa LaChance runs DIRTRich Composting in Columbia Falls, MT. 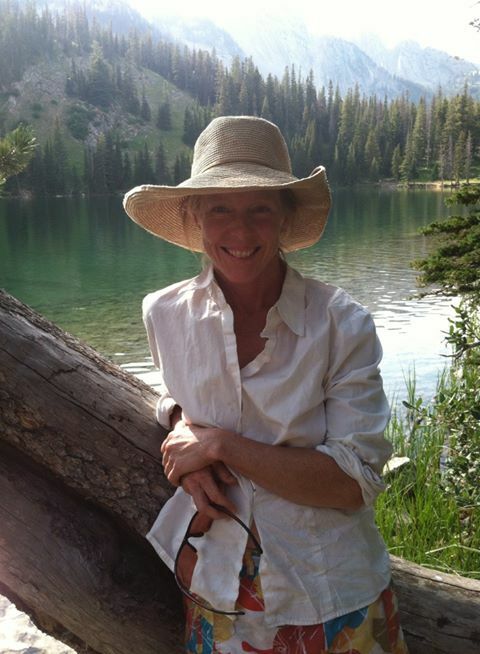 On election day 2016 she shares her journey starting this business, some of the challenges needed to overcome, and the successes she has had from composting for restaurants and Glacier National Park’s biggest Hospitality provider Xanterra. 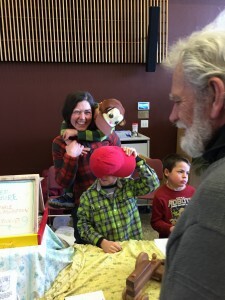 I first met Mandy, when I went to the Kalispell Farmer’s Market last spring hoping to meet some potential guests for my show and see what I could learn. Mandy stuck out to me right away because hanging above her head at the rear of her stand was a gorgeous oversized photograph of her children! After purchasing the most DELICIOUS nutrient dense cauliflower from her she consented to doing an interview and I later found her on Facebook where I connected with her husband Jay. I saw that they were giving a farm tour in two weeks and marked it on my calendar. But I had no idea what I was going to see that day. I learned so much about where we want to get to. All the things my husband has been talking about and dreaming about were put into action all at the Lower Valley Farm. If there was a Vogue for gardeners Mandy would take the cover. With the hot sunshine searing down on her back she took me and about 25-30 people around her farm, teaching us about their methods enabling them to produce enough food for market. I just cant find the word to help you visualize this woman, standing there all toned and muscular maneuvering the tools showing us how to use them effectively. There was so much food. So many plants. It looked like enough work for 6 people!!! Maggie Saska Plant Production Specialist from the Rodale Institute shares her knowledge about growing vegetables as well as internship opportunities. Jes Pearce explains the Bio-intensive Method. Jes Pearce is another one of those amazing rockstar millennials who do exciting things while being advocates for the planet and great stewards of our land here today to inspire you with her story! So I’ve been working on getting a guest from this organization for a long time, and I think we got the perfect person from the USDA’s Natural Resource Conservation Service, Andrew Malucelli, from Ronan about 150 miles south of me, 120 miles south, 60 miles north of Missoula. Good Seed Company sells organic and ecologically farmed seed that’s all locally adapted, biodiverse, non-gmo, open-pollinated, and heirloom. Their goal is to support communities in reestablishing their own practice of selecting, saving and sharing seeds, in order to support communities in rebuilding their own local supply of biodiverse seeds for common use. In 1980 started in Okanogan Highlands in NE Washington state individuals who had 600 acres of pristine land and they grew food their family wanted to be growing their own food and had to do a lot of research in identifying of plants that did well in their altitude their (probably zone 3-4) as things grew they began to save and sell seeds and that’s how the Good Seed Company got started. 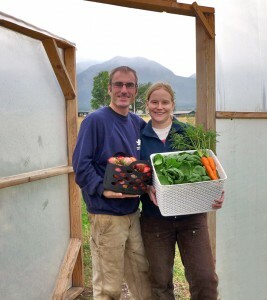 Kelly took her PDC, permaculture design course in 98 with CRMPI Central Rocky Mountain Perm. institute, and also with Michael Pilarski. Kelly has been a constant podcast listener for the last 2.5 years starting with Paul Wheaton of www.permies.com, Scott Mann of www.thepermaculturepodcast.com (Of which I have an interview with him Feb of 2014 on permaculture and the Kingdom,-Christianity) www.sustainableworldradio.com with Jill Cloutier. and Jack Spirko of www.thesurvivalPodcast.com. She taught 3 of the Inland Northwest permaculture conferences, and has studied with Sepp Holzer, Darren Doherty of Regrarians and Keyline design, Grant Schultz on Farmscale Permaculture, and many more great innovators, recently attending Permaculture Voices 2 conference this year, Seattle convergenes as well as Transition Towns conferences. Her new website Permaglobal.com will feature all the video of classes as well as translations of many podcasts into Spanish. 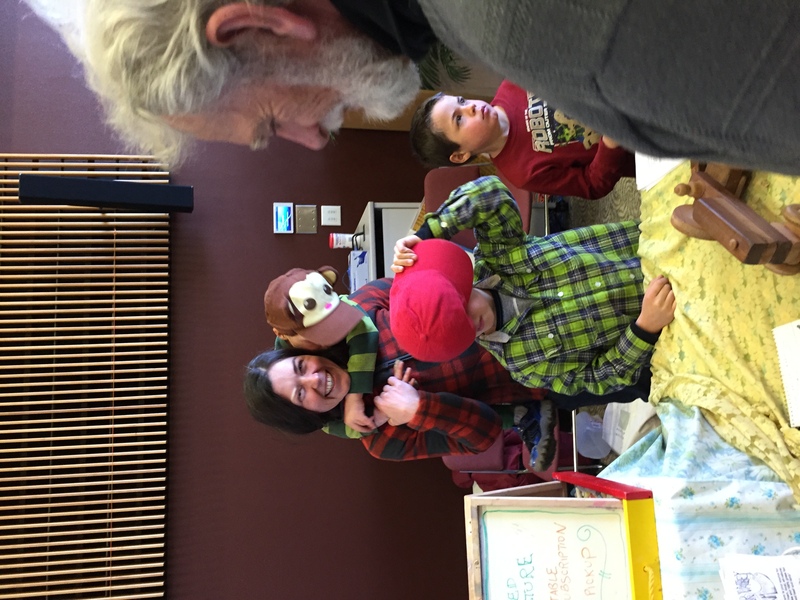 She tends her home lot, and a church garden food forest in Bigfork, MT and intend to become a designer/planner. She has set up several community gardens through sheet mulching, and share what I can in classes and on FB. She thinks this is her calling, and hopes to help people make the shift to healthy and abundant food and healthy, happy, productive lifestyles and community systems. 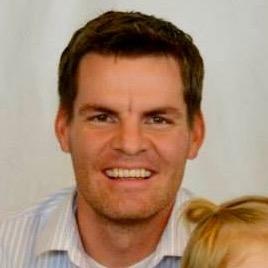 Bill McDorman is Executive Director of Rocky Mountain Seed Alliance, Ketchum, Idaho. He got his start in the bio-regional seed movement while in college in 1979 when he helped start Garden City Seeds in Missoula, Montana. In 1984, Bill started Seeds Trust /High Altitude Gardens, a mail order seed company he ran successfully until it sold to an intern in 2013. He authored the book, Basic Seed Saving, in 1994. In 2010, he and his wife Belle Starr created Seed School, a nationally recognized weeklong training. He served as Executive Director of Native Seeds/SEARCH from 2011 to 2014. Bill is a passionate and knowledgeable presenter who inspires his audiences to learn to save their own seeds. 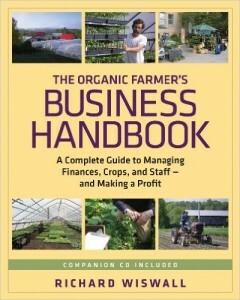 Richard Wiswall is the author of the Organic Farmer’s Business Handbook: A Complete Guide to Managing Finances, Crops, and Staff – and Making a Profit. This book comes with a companion CD that included templets for creating worksheets, budgets including cash flow projections, and even payroll. He’s manager of the Cate Farm a family owned and operated organic farm in Central Vermont that includes 22 acres and seven 100-foot long greenhouses of organic vegetables, medicinal herbs, and flowers. Everything they sell is certified organic. I try to get people to spend a little time to work on their business not just in their business, and ask them to set aside 3 hours to do some long range thinking and planning and look at the business and also analyze where the money comes and goes so you can work fewer hours and make more money, ultimately that would be great that’s what a lot of people want. 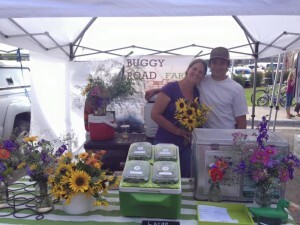 Buggy Road Farm is a microfarm specializing in duck eggs, asparagus, plant starts and microgreens. They use growing methods in line with their ethics: No chemical sprays, pesticides, herbicides, GMOs, antibiotics, hormones, or cages. 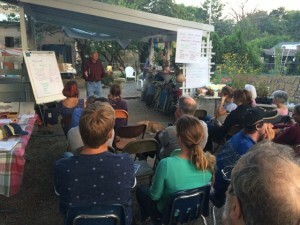 Ben is a Vegan, and a Master Gardener in southwest VA practicing permaculture. 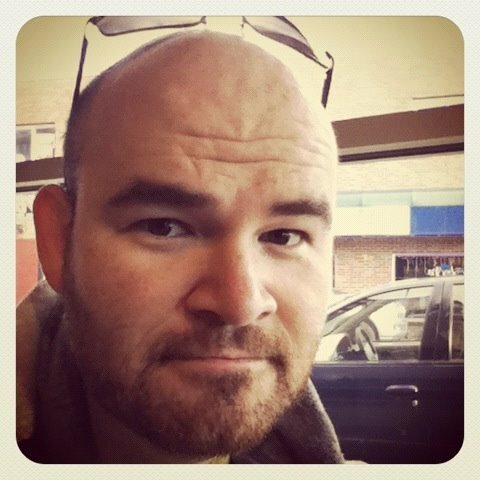 Currently Ben works as the Planetarium guy at the local science museum, but has also worked as a graphic designer, educator.